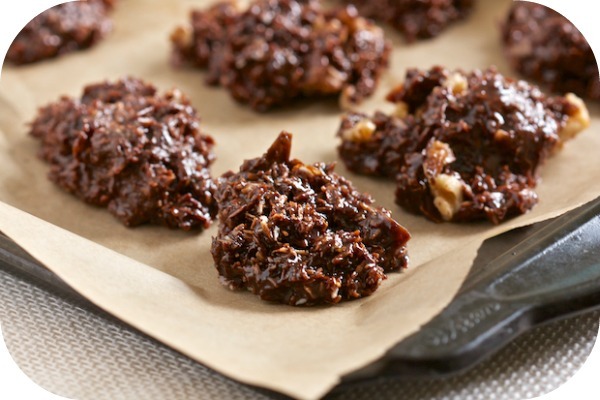 Remember no-bake cookies? Those chocolate peanut-butter cookies that were pretty much the only way the oatmeal got used up? My mom used to make huge batches of them around Christmas time and they were so addictive! What’s my point, you say? Well, I’m glad you asked. Because I have discovered a way to have that flavor, warm and healthy, for breakfast. Whaaat you say? Yes, you read that right. Chocolate. Peanut butter. Warm. Healthy. Breakfast. Did I mention that it’s healthy? 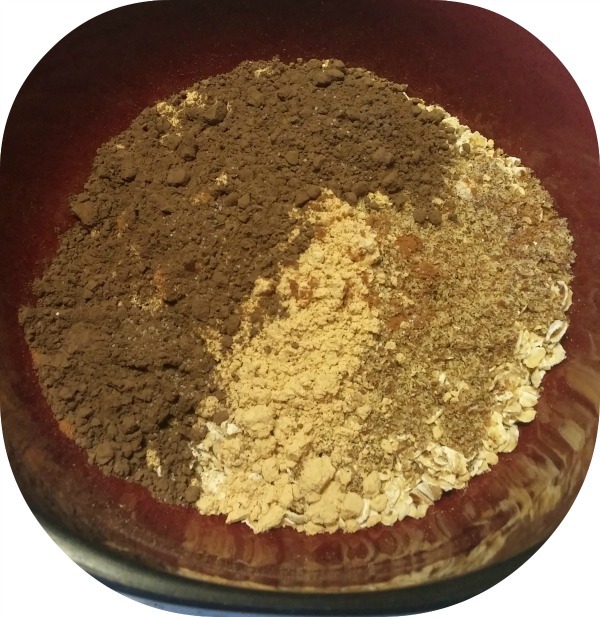 Oats have always been an inherently good-for-you food, courtesy of Mother Nature, and with the addition of milled flax seed, unsweetened baking cocoa, and powdered peanut butter (you have to try this! ), each serving of this glorious concoction packs 10 grams of fiber, 11 grams of protein, and NO processed sugar for under 300 calories! In a glass or ceramic bowl (so, a cereal/soup bowl), dump in your ½ cup of dry oats. 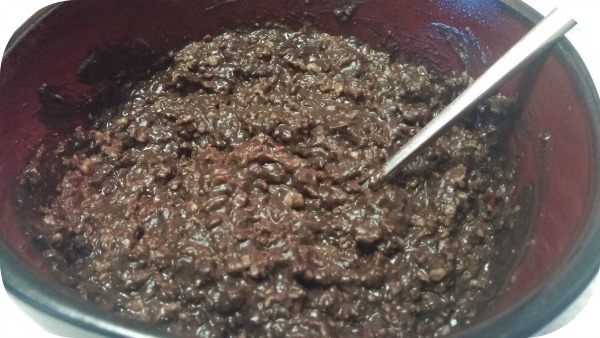 Top with flax seed, baking cocoa, powdered peanut butter, salt, and cinnamon. Stir it all together. Heat water to boiling in a tea kettle (you could also use the microwave). Pour the boiling water over your oatmeal mixture, add the vanilla, and give it all a good stir. Let it sit for 5 minutes or so. Come back to it and stir it once more. 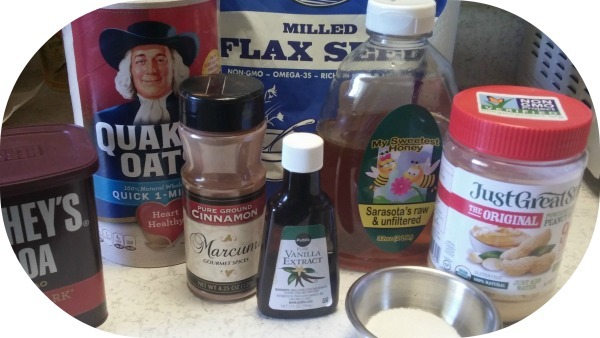 It will not be sweet, so if you want it sweet, drizzle on a tablespoon of honey and stir it in. Taste. If the sweetness is just right, sweet! If not, add some more honey (I won’t tell). Breakfast (or lunch, or dessert) is served! Note: This concoction has been my little secret for years. Whenever someone sees me eating brown oatmeal for breakfast I get weird looks, but it really does fuel your engine at least until lunch, if not even further. Please tweak it to your own liking, enjoy, and share! Another note: You can substitute regular creamy peanut butter for powdered peanut butter, but just make sure to stir it in last, and be aware that it will change the nutritional content of the recipe. From experience I can tell you that it’s every bit as delicious, even more so if you prefer the more pronounced peanut butter flavor.